This guide has the information and guidance needed to help you implement the safety measures needed to help avoid slips, trips and falls. By taking the right precautions, you can create a safer workplace for your employees. Brady (NYSE:BRC), a global leader in industrial and safety printing systems and solutions, today announced its “Slips, Trips and Falls: Advancing Your Safety Program” Guidebook. This guide explains the impact of slips, trips and falls, where and how incidents occur, and prevention steps to avoid them. The Slips, Trips and Falls Guidebook provides in-depth information on the 10 steps to prevent slips, trips and falls, and what to do if an incident occurs. To help readers establish an effective safety program, this guide also includes background information on the regulations around slips, trips and falls, the impacts of an occurrence and a list of potential hazards in the workplace. 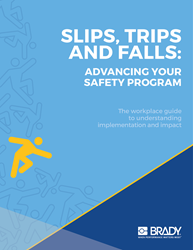 Learn more about the implementation and impact of an effective safety program – download the Slips, Trips and Falls Guidebook.